WE HAVE NO PUPPIES AVAILABLE AT THIS TIME, SORRY. 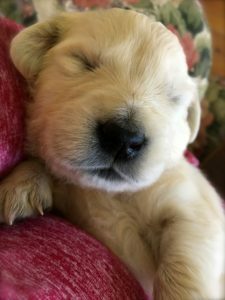 Please welcome Marley and Martin’s litter of English Golden Retrievers! This litter is a first for Martin and a last for Marley. Happy Retirement Marley! 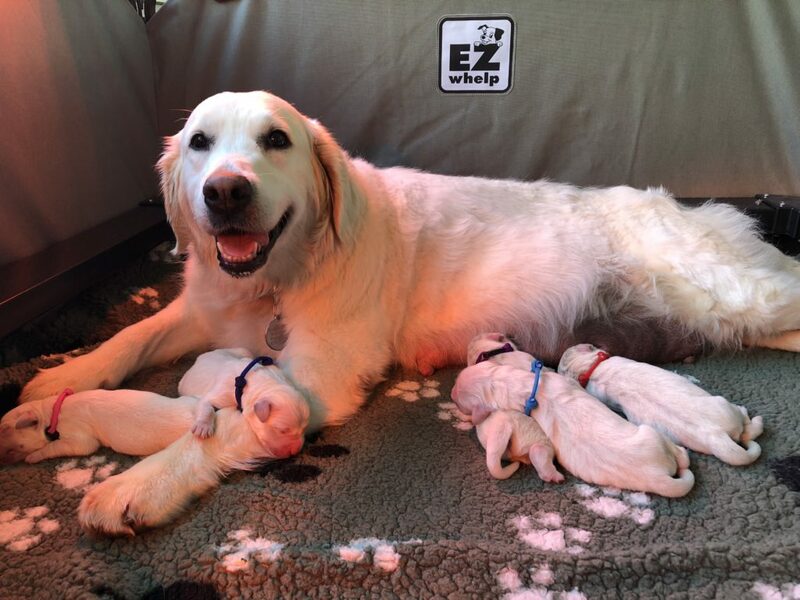 On Nov 7th, 2018, Marley delivered 5 healthy and beautiful English Golden Retriever puppies. This was a children’s TV program with animated characters that lived on the Common in burrows, and collect litter to make it into something new and useful. Puppies playing at 5 weeks. 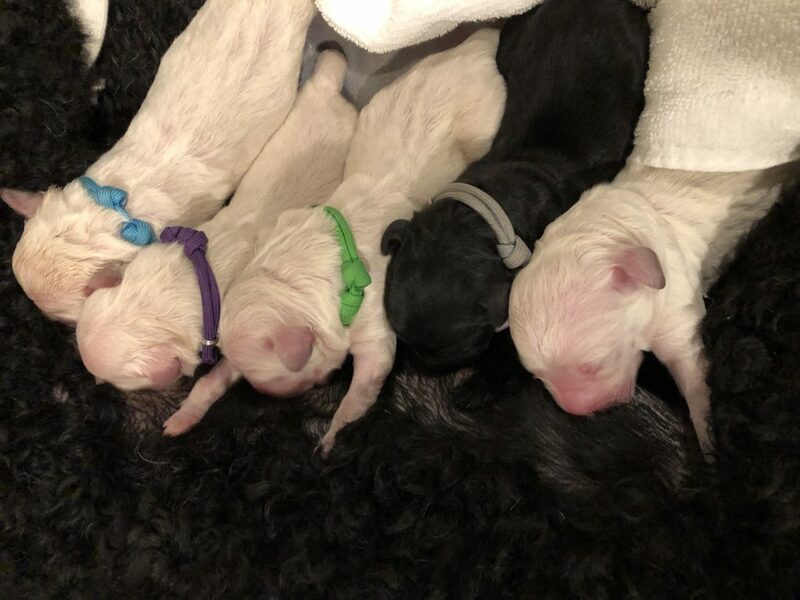 Please welcome Ruby and Martin’s litter of English Teddy Bear Goldendoodle puppies! This litter is a first for Martin, and a retirement litter for Ruby. 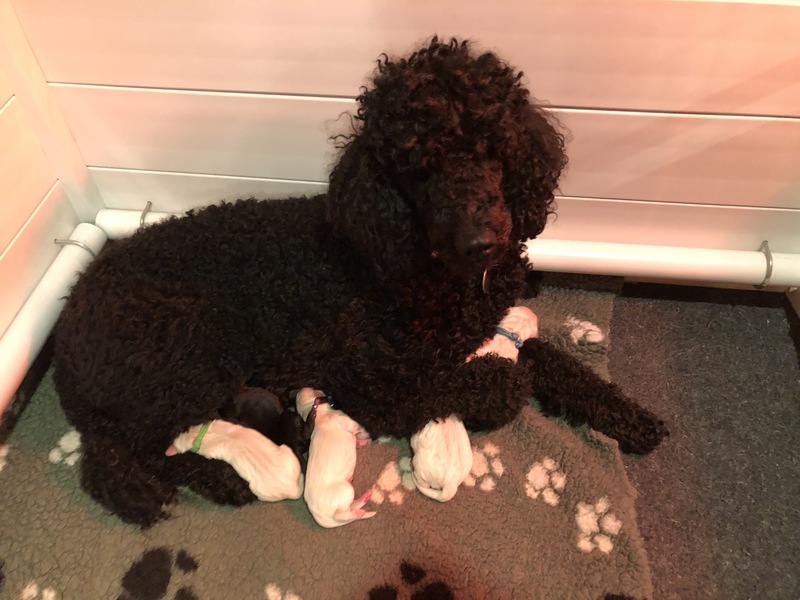 On November 20th 2018, Ruby delivered 5 healthy and beautiful Teddy Bear Goldendoodles. One black boy, three cream boys and one cream girl. They are being named for the British children’s TV show, the ‘Magic Roundabout’. 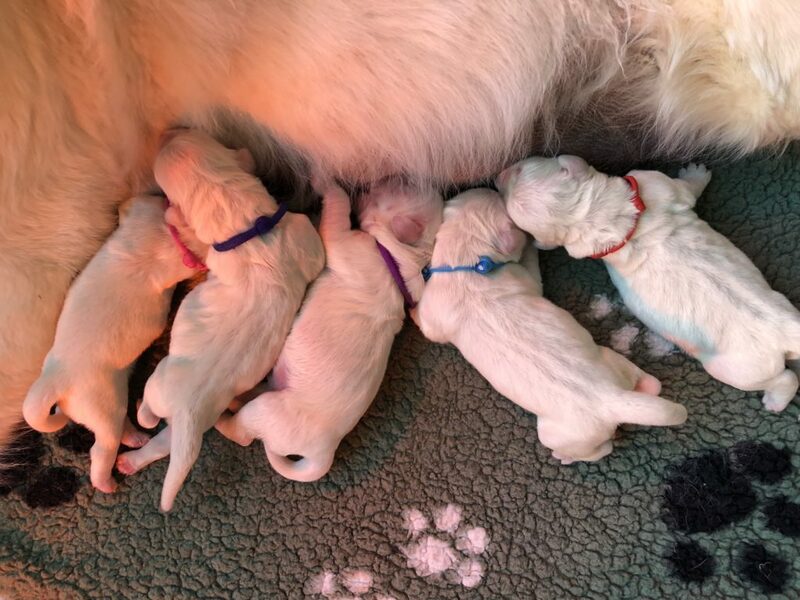 Born Nov 29th 2018, 11 healthy and beautiful puppies, 7 girls, 4 boys. This litter is named for British children’s TV shows. Britannia Farms needs excellent guardian homes so that we can further our breeding program without having too many dogs at our facility. Guardianships enable breeding dogs to live one on one with a family while they are participating in our program. They are loved and cared for by the same family, their ‘forever family’, one that they will be living with when they retire. Guardian Dogs are placed with a $500 upfront fee. 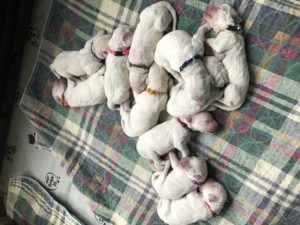 For each litter produced by a female, the Guardian family will receive $500, or a $500 discount from the price of a puppy from the litter if they wish. For each litter from a male, the Guardian family will be compensated $250. Our puppies sell before they are born generally, so advance notice will be required to be on the list. Your puppy will be the our ‘Pick of the litter’ puppy. This is one that we consider to be the best example of what we are trying to achieve in our breeding program. Our Guardian family will be hand picked by us. 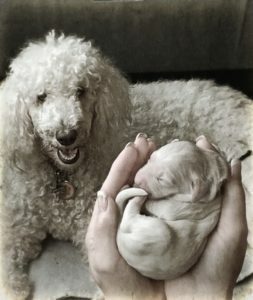 Your puppy will have health testing done as we require for all the breeding dogs in our program. This is done to ensure health and quality in our lines and so that we may confidently offer a two year health guarantee on our puppies. This will start around one year of age. If your puppy does not pass the testing, the guardianship will be terminated, dog spayed or neutered, and the guardian will have ownership of puppy with no further monies due. Life changing results will be considered individually, and refunds may be given according to the contract and puppy guarantee. There will be a specific contract for each guardianship arrangement. Guardians must not have any other intact dogs, males or females (spayed or neutered pets are fine). Of course there are certain criteria we are looking for in this very special role as a Guardian family of a Britannia Farms dog. 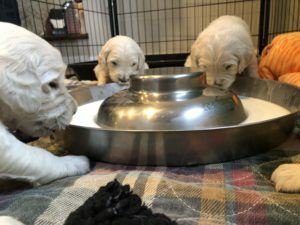 We are looking for families that have time and energy to spend training a puppy and socialize it to at least 3 sessions of puppy kindergarten and basic training up to, and possibly including the test for “CGC” Canine Good Citizen. 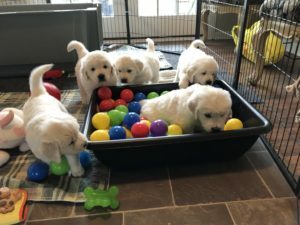 An additional $500 will be offered to families that train their puppy to the “Therapy Dog” certification. Families will need to make sure their dog is well socialized, good with children and other dogs, and comfortable with strangers. Families with one parent at home during the day/work from home will be preferred, as are families that live within close proximity to our facility.